Writing Helped Save This Former Juvenile Offender. Now He's Helping Jailed Youth. Jimmy Wu had been behind bars for nearly a decade when he received heartbreaking news in 2005: His younger brother had developed a severe case of pneumonia that doctors said he was unlikely to recover from. Overwhelmed with despair, Wu turned to an outlet that he had learned to depend on in the years he served in prison. He picked up a pen, put it to paper, and wrote out his sorrows. “That was a moment where it was writing that really saved me,” he said. More than a decade after that fatal prognosis, Wu's brother has defied the odds and remains alive, and today Wu serves as interim executive director of InsideOUT Writers (IOW), the nonprofit that helped him learn to deal with some of the more turbulent times in his life. In California, where IOW operates, 53.8 percent of juvenile offenders released from the Department of Corrections and Rehabilitation are convicted of a another crime within three years of their release, according to a 2017 report by the state. With former juvenile offenders at high risk for repeat offenses, the group encourages their clients to use creative writing as a tool for personal development. Given his experience as a juvenile offender, one of the writing teachers at IOW thought Wu would be a perfect fit for the organization when he was released in 2009 after serving thirteen-and-a-half years in prison because he would be able to relate to the struggles that the youth the organization serves endures, Wu said. Wu said that he didn’t fit the "profile" for juvenile offenders before landing in prison. He was about 2 years old when his family immigrated to the U.S. from Taiwan, and said he couldn't have asked for a better childhood. He wasn't involved in gangs, criminal activity, or drug use, and his parents were financially well off for a time. But his world began to crumble when his parents divorced when he was 12 years old. He went on to live with his mother, and his brother Aaron went to live with his father. When Wu was 15, his brother was diagnosed with Duchenne muscular dystrophy, a disorder characterized by progressive muscle degeneration. At the time of the diagnosis, the average life expectancy for individuals with the disorder was 25 years, according to a 2012 study published in International Journal of Endocrinology. “It was heartbreaking for all of us because we always hoped to outlive our parents, and then we were given the news that my younger brother was now quite likely going to be the first in our family to leave us,” Wu said. To help him cope, he sought support from people outside of his family, but some of the people he reached out to weren't the best influences. At 16 years old, Wu and some of his friends tried to steal a car with two passengers inside, an act that Wu said led him to charges for carjacking, kidnapping, and armed robbery. For the kidnapping charges, Wu faced two life sentences, but he took a plea bargain that reduced the charge to false imprisonment and the total sentence to 15 years and eight months. In 1996, Wu was serving time at Central Juvenile Hall in Los Angeles when he was invited to participate in a creative writing class hosted by IOW. He had no interest in creative writing at the time but agreed to join the class so he could spend more time outside of his cell. It ended up being a surprise for Wu. He found a mentor and friend in the man who taught his class, and writing became a positive way for him to vent the emotions he had carried for the last several years. When he turned 18 and transferred to an adult correctional facility, Wu leaned on his newfound coping mechanism to carry him through. In the facility, he was the youngest and smallest prisoner in a yard of more than 1,000 grown men, he said. Wu mainly wrote letters to his family and friends, retracing his footsteps and telling those in his circle everything he had gone through. Some of his letters were as long as 30 pages, Wu said. “It was a way for me to just keep my mind occupied. There wasn't much … prison work that was mentally stimulating, so it was good for me to at least have that and just do it on my own,” he said. His favorite time to write was in the evenings, when the daily commotion within the prison walls subsided. After spending more than a decade in prison, Wu was released in 2009. He eventually began working as the case manager for IOW, making weekly visits to juvenile detention facilities to gauge the goals and needs of young offenders. He also talked to them about his journey through incarceration and the work he does at IOW. One of the highlights for Wu during his earlier years as a staff member of IOW was meeting several students while they were incarcerated and working with them after their release. “Just being able to meet them where they were while they were in custody and then having the privilege and opportunity to work with them and for them once they came home, that was a really profound full-circle experience for me because it just showed me how incredible the work is that we do,” he said. In March, Wu assumed the role of IOW's interim executive director. The role entails predominantly administrative tasks, which leaves him with little time to make trips to juvenile detention facilities where IOW holds classes. But one of his duties in his new position includes oversight of IOW's alumni program, which was established in 2009, the year Wu was released from prison. 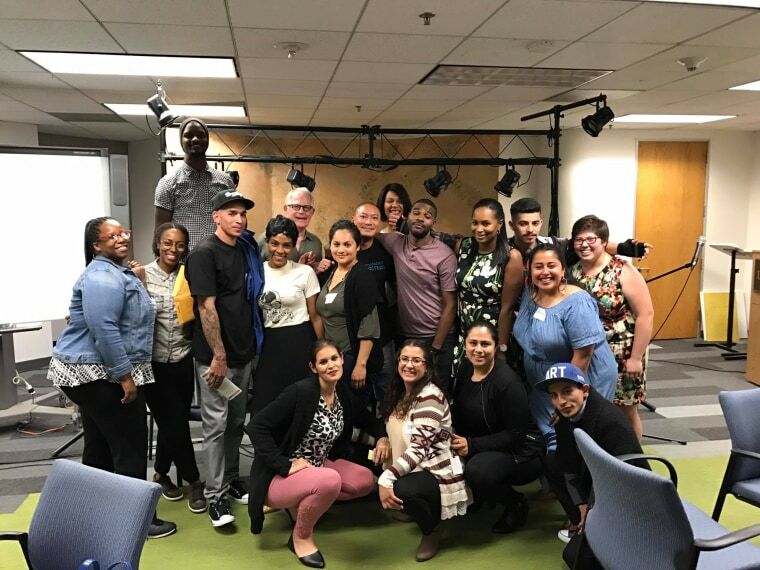 The program provides services — such as mentorship and life skills enrichment sessions — that are aimed at reducing the likelihood of program alumni re-offending. To accomplish that new responsibility, Wu makes use of social media to check in on IOW alumni, but also does in-person checks whenever they visit the organization's office. He calls himself an unofficial mentor to all alumni. Sitting behind his desk inside the IOW office in Los Angeles, Wu recalls the events that led him to his role in the organization and the importance of writing in his life. The one person in his story who comes up several times is his brother, who today is 28 years old. “At one point I had nothing but my imagination to rely on to just help me keep going forward because there was nothing exciting at all or stimulating in prison," Wu said. "My brother is kind of in the same thing because of his inability to be out and about. He's stuck at home in his body usually just watching TV or on his computer through a voice dictation software program"
CORRECTION (Sept. 13, 2017, 1:20 a.m.): An earlier version of this article misstated the start date of IOW's alumni program. The program started in 2009, the year Wu was released from prison, not 2012.